When you're trying to lure an opossum into a trap (or perhaps out of your yard), you're going to want to know what foods you can use to attract these creatures. Whether you're trying to actually contain a problem opossum prowling around your property or you're just curious about learning more about the diet of this reclusive species, keep reading! So, What Do Opossum's Like To Eat? You'll have a much easier time finding objects that an opossum won't try to ingest rather than trying the pin down each and every thing they do eat. Like humans, opossums are omnivores—they eat both plants and meat—and in their case, pretty much everything in between. Check out the detailed sections below for a little more insight on how their diets break down. Did you know that opossums are actually beneficial animals? Despite their creepy appearances and catatonic-like states of panic when humans come around, these animals are like nature's exterminators! Opossums regularly feast on cockroaches, mice, rats, spiders, slugs, snails, insects, frogs—you name it, they probably eat it. These animals specialize in consuming the unpleasant critters in your yard; getting rid of them so you don't have to! You know those unsightly weeds you want to get rid of in the garden? You guessed it—opossums will happily eat those. They prefer to eat wilting, decaying plant matter over healthy, well-nourished crops, which breathes a sigh of relief into every green-thumbed gardener out there. If you've ever seen a fresh piece of roadkill, the image of a mother opossum with babies riding on her back surely isn't far behind in your head. The reason these two thoughts are connected is that opossums feed on carrion—another term for dead animals—and are commonly seen munching on the carcasses of decaying animals on the side of the road. In the wild (as well as in your backyard), opossums enjoy picking the bones of dead animals clean, and will take advantage of any carcasses they find lying around. Okay, so opossums basically eat anything and everything. That much is clear. But what are some of the especially crazy things they ingest?! Here's something we bet you didn't know: despite the fact that it's one of the most dangerous snake in the USA, opossums can eat a rattlesnake with no problem! Well, it turns out that opossums have a protein in their blood which make them immune to a snake's venom. To an opossum, a snake is just another food source, no different than a frog or a really long slug. Scientists are currently using the blood of opossums to help develop anti-venom for human use. To learn more, check out the video below. Guess what lives in your trash? Rats, mice, roaches, ants...the list goes on and on. And guess what eats all those things? You guessed it! Opossums. Wherever there are household pests, there will also be opossums to hunt them down. Of course, this is beneficial in the form of free pest control...but when there's an animal ransacking your garbage area in order to grab a free meal, things can get pretty messy. In addition to following the pests, opossums themselves are attracted to the scent of the garbage—particularly trash that has food scraps mixed inside. This can be problematic for homeowners, especially when the opossums tear into garbage bags and scatter trash through the yard in order to find the scraps they smell. If you find yourself setting out food for your dog or cat, but seeing it disappear before your furry friend has a chance to chow down, an opossum might just be the culprit. It's not uncommon for opossums to feed on pet food left outside homes, especially in urban areas where there's not much wildlife or roadkill to forage for themselves. Oftentimes, this is one of the first signs that an opossum is prowling around a property, as their reclusive nature and nocturnal schedule keeps opossums from coming out and interacting with humans in the light of day. Opossums are, essentially, like nature's garbage disposals; much like raccoons, these little guys will eat just about anything. Whether you're trying to bait an opossum into a trap or understand why the one in your yard seems to eat everything in sight, we're here to shed a little light on their feeding habits. 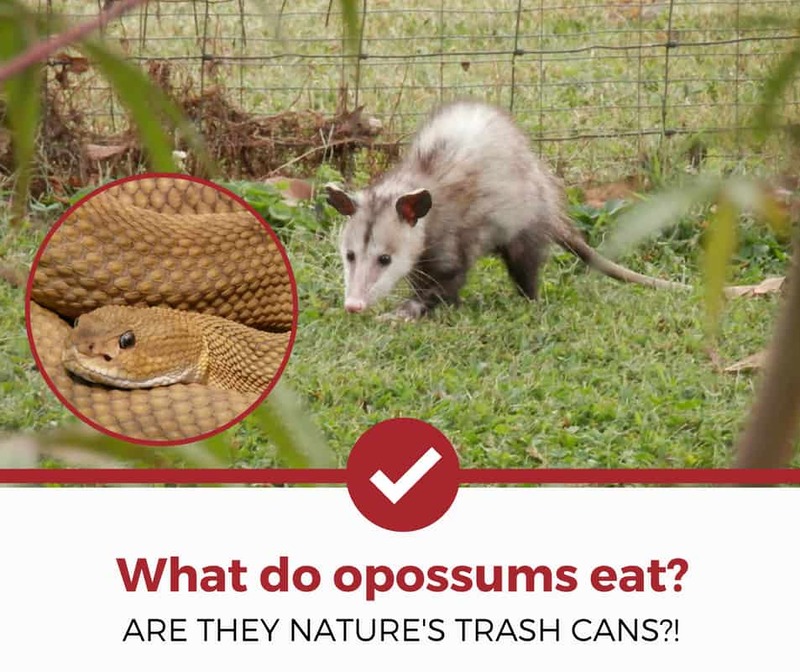 With our article, you'll know that it's much easier to ask yourself about the foods that opossums don't like rather than what they do eat! Curious about other opossum related guides? Check out our other detailed guides to help you deal with your pest problems.